Bought a paper online and got caught? Advice from a lawyer for students. College is stressful, and students can fall behind in their work. The pressure to keep their grades up can cause students to turn to websites that claim, “pay us and we will write you a 100% original paper, guaranteed.” However, the guarantee is rarely ever truthful. I have worked with several students who used a service like this and then were flagged for plagiarism. 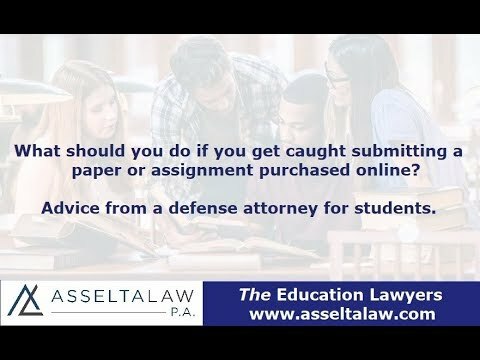 What should a student do if caught turning in a purchased paper? Students are usually caught when professors use plagiarism checkers. Buying a paper can cause a student to face not one but several honor code violations. These violations can be tough to defend against because it is challenging to argue against a similarity report like the one that Turnitin uses. Just saying you didn’t plagiarize while a report says otherwise is not a good defense strategy. You need evidence to prove this. I work with students to figure out if there is evidence to support they didn’t plagiarize or find a way to negotiate for a lower sanction. Click here to read more about plagiarism.